The serene, heavenly theme to this clock gives this model its name....Precious Angels. 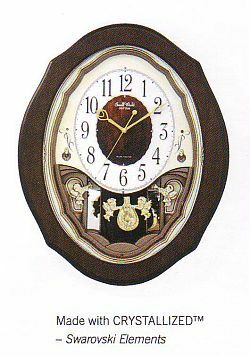 Encased in a beautiful wooden frame, the clock has a crystal pendulum accented by 2 angelic figures. The clock plays 18 melodies, 6 being Hymns. A "precious" clock that you will surely cherish. Clock is battery quartz operated. Comes with 2 D size batteries.